Potassium cocoate is a potassium salt that originates from the fatty acids present in coconut oil. While coconut oil is edible, potassium cocoate is not. The substance, also known as potassium coco soap, is a translucent pale-yellow liquid that contains glycerine, a moisturizer. 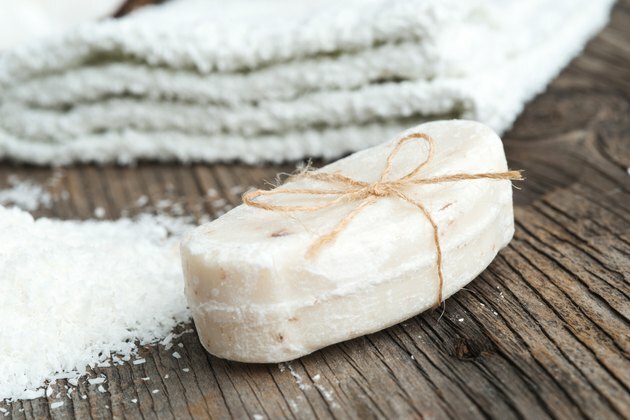 Manufacturers use potassium cocoate to make soaps and shampoos. Potassium cocoate is a natural surfactant, a chemical that removes dirt from the surface of objects and skin when you mix it with water. This substance loosens and keeps dirt and grease off surfaces until they flow down the drain. Surfactants such as potassium cocoate spread molecules apart, reducing a surface's tension. As a result, the dirt and grease trapped by those molecules are released. The grime rises, leaving the surface below clean. The Cosmetic Ingredient Review assesses how safe cosmetic ingredients are. The organization finds potassium cocoate to be safe when used at a maximum of 40 percent of the components in the product. Despite being safe as an ingredient, concentrated potassium cocoate as a raw material can cause irritation if it gets in your eyes. When that happens, rinse your eyes with plain water. Remove your contact lenses if you have them in. Consult a doctor if the irritation persists. The chemical can also irritate your skin and cause breathing problems. Wash the area the product touches with soap and water. Move outside or to a well-ventilated room if you inhale potassium cocoate's fumes. Seek medical attention if you do not feel better within a few minutes or if breathing becomes more difficult. What Happens if Silica Gel Is Ingested?